technology knowledge they ensure that raw materials e.g. milk from cows, sheep, goats, camels etc. are manufactured into a wide range of finished products including liquid milks, cheeses, ice creams, powders and ingredients, yoghurt, butter, sports drinks and baby formulas. Advanced Dairy Technologists are in roles developing, producing and controlling production of dairy products. They know how dairy products are produced and they operate and manage process, filling/packing and cleaning plant and other dairy unit operations. They ensure that plant performance and the final dairy product and volumes are in accordance with specifications and targets by monitoring and adjusting process and equipment settings and by carrying out tests on equipment and product. They monitor waste levels and ensure that the hygiene of the production environment is in accordance with legislation, regulations and product quality requirements. Continuous improvement, problem solving, project management, tests and trials are activities performed in all areas as part of the daily job. 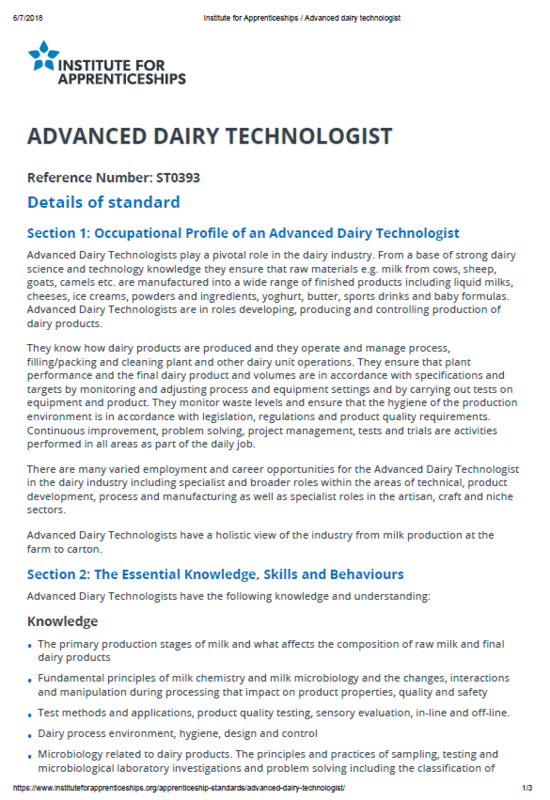 There are many varied employment and career opportunities for the Advanced Dairy Technologist in the dairy industry including specialist and broader roles within the areas of technical, product development, process and manufacturing as well as specialist roles in the artisan, craft and niche sectors. Advanced Dairy Technologists have a holistic view of the industry from milk production at the farm to carton.